It’s quite chilly these days in the Land of the Long White Cloud. Lucky for us, we can turn up the heating. But just think how it must be for your grass out there. Our grass puts up with a lot, but sometimes the colder weather can be a bit too ‘nippy’. Many plants go into dormancy over the colder periods and can lose their green colour. Freezing temperatures can turn your lawn brown, but don’t fret, this is perfectly normal. Don’t fertilise your lawn during winter, instead wait for the natural cycle to occur during the spring season. Remember to water your plants and grass as they still need to keep hydrated during the colder months. Drought can occur even in winter which can cause roots to dry up and die. ‘So, when should I water my plants and grass’, you may be asking? The simple answer is: do it in the morning. This way the moisture has plenty of time to soak into the soil. If it’s done at night, sometimes it doesn’t evaporate well. This means it stays on the blades of grass and this encourages fungal growth. You don’t need to water as much as you would in summer, about half of what you would normally have done. It’s also a good idea to give your plants a water if you know a frost is coming. Plants that have cells full of water will be stronger against damaging cold breezes. Be careful not to over water though, try to reduce watering during cold spells. Move any indoor plants that are still outside under cover, or inside. If you have any outdoor plants you are worried about frosting over, try placing a frost cloth over them during nights to insulate a little bit. It’s best to purchase a commercially made frost cloth from a garden store. The fabric is light and woven to allow airflow and light in. It’s also thick enough to retain warmth in the soil. Just remember to tuck in your plants in the windy weather and weigh down the frost cloths with rocks or potted plants to keep them from flying away! There’s something about a frosty morning and icy lawn that is magical. But don’t be fooled as the icy shards are dangerous little daggers to a blade of grass. 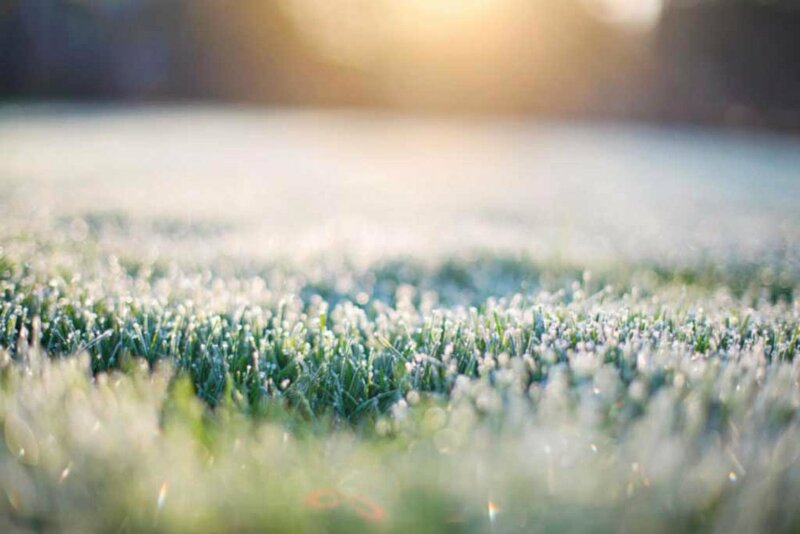 A frosted lawn will bruise and break grass blades easily with a little pressure on the ice. This means yellowing grass and brown or black damaged spots when the grass dries. So if your lawn does have a frost over it, try to avoid walking or driving over it until the sun has warmed things up a little. Keep mowing your lawn in winter too, most people mow their lawn a little less frequently in winter. Try to avoid mowing in heavy rain. It won’t kill you, but will make it a lot harder. Another tip is to cut your lawn a bit longer than you normally would. A longer lawn reduces the risk of ‘scalping’ which is cutting the lawn too short - making it susceptible to weeds and further damage. The longer blades will help protect the root of the blades from getting damaged by the frost. If your plants have suffered in the cold, don’t fear the worst, and don’t run straight for the snips. Despite how badly you want to give them some love, clipping any dead looking branches immediately after frost will shock the plant. Wait until the sun has warmed them up for a few days. Keep watering plants after frost strikes as it will stimulate growth. Prune after several days of a frosty spell, this will give the plant a good chance to repair itself. Scratch back the bark to see if any branches are dead - revealing a tan or brown colour underneath or a healthy looking green. Delay wood plant pruning until the end of spring to give them more time to grow and show what parts of the tree are still alive. Hopefully you feel a bit more prepared for the upcoming cold spells and remember: Keep watering, keep cutting the lawn, and look after your plants. But most importantly - don’t step on the grass! Frosts in New Zealand can often be unexpected so we recommend you go out and grab yourself a frost cloth as we enter the cooler period. Your lawn will thank you for using these tips in spring, and hopefully your garden will fare better in times of frost too. What grass is between your toes?